Animation has been practised in Australia from a relatively early stage in the worldwide history of cinematic animation, as evidenced by quite mature examples of cutout animation by cartoonist Harry Julius beginning in 1912. It may therefore seem odd that there is comparatively little written of its history. In America and Europe established histories of animation have been recorded. The growth of the medium in these other countries led to the comparatively early establishment of institutions teaching its history and practice. A history of animation is not a definitive or closed text. Rather it is the collection of information as sources diminish with time, and its evaluation and sifting to construct a factual narrative. But in Australia there is little firm basis upon which to assess the Australian contribution to the medium, or the trends towards the future. The progress of the major commercial companies has been spasmodic, a series of peaks and troughs in which the troughs have fortunately been levelled to an extent by the work of smaller companies and individual independent animators. There is need for a recorded history – perhaps more than one is necessary to fully reveal the multi-layered identity of animation in Australia. With animation’s becoming an accepted discipline for study and source for critical writing, it becomes important to define each country’s history of its foundations and growth, whatever the significance, to identify each national animation in its subject and form, and to stimulate its capacity to survive as a vigorous medium both nationally and internationally. This certainly is not to deny the valuable contributions of others that have published invaluable Australian historical material based upon their original recordings of animators’ visions (eg. Bradbury 2001; Quigley 2005; Monahan 1989; Bendazzi 1994). Yet a definitive history of Australian animation is unlikely to be constructed immediately. It is more likely that a future historian will sift through the data recorded by different researchers, thereby achieving a more comprehensive balance. It has been our wish to augment this data by recording through videoed interviews the recollections of those people still living from the earlier periods, and those of the contemporary animators. From these we would portray the work of the numerous smaller companies and independent animators, critically analysing particular films of significance, aiming to augment the existing account to a richer, fuller and more complex chronicle. We have thus far recorded over fifty videotaped interviews. With these, together with substantial archival research, we have commenced a series of monographs devoted to individual practitioners. We envision emerging from this study a more comprehensive text assembling a background to Australia’s animation progress, simultaneously offering a greater theoretical consideration of original Australian animation. Australian cinema is said to have commenced in 1896 with visiting Frenchman, Sestier’s film, Melbourne Cup – its French title Les Courses – immediately followed by a local production of documentaries (Bertrand 1989). Of particular note was The Soldiers of the Cross, produced in 1900 in Melbourne, which was an extravagant hybrid of film projection (3,000 feet of film) and magic lantern slideshows (200 coloured slides). The slides were projected using a ‘tri-unial’ three-lens lantern, enabling many ‘animated’ effects (ABC 2001). However, Australia was first more widely introduced to animation when Sydneysider and political cartoonist, Harry Julius, visited New York in 1911 to discover animated film making, returning to Australia to spend a lifetime making animated shorts and commercials for the Ure Smith and (his own) Julius Studios (Bradbury 2001). From these early experiments an animation industry developed in Australia. Australian Animated Cartoons opened in 1936. The first major animation company was the Eric Porter Studio, which began in Sydney about 1939, expanding into some major productions until the mid 1970s (Torre 2004a). Air Programs International, which commenced in 1962, expanded the boundaries of animated commercial films beyond the slapstick cartoon with a series of sixty-minute adaptations of literary classics. This genre of production was extended by the films of the Burbank Animation Studios (Torre 2007a; Torre 2007b), and further extended by Southern Star (Torre 2007c). But the dichotomy continued between the animated films of the commercial studios and those of the independent animators. The studios persistently reflected the animation cultures that originated and developed in America, spurred by investments from the United States in the Sydney studios of Hanna Barbera, then Disney. According to Bradbury, ‘The U.S. was the primary inspiration for, but also the primary menace to, an indigenous film and animation industry. The sheer size of the American enterprise threatened always to overwhelm the home-grown product’ (Bradbury 2001, pp. 207-08). 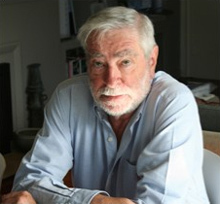 Australia in the 1970s was not subject to the intense union influence and resulting high wage structures and work limitations that were imposed on the animation industry in the U.S.A. Bill Hanna saw the opportunity to cut production costs by opening a studio in Sydney, where he found an existing and strong nucleus of well-trained animators. Hanna Barbera opened its Sydney studio in 1972, thus consolidating a move by American companies to contract animation to Australia. The first productions of his Sydney studio were Robin Hood and Funky Phantom. He spent some years in Sydney during which he oversaw and stimulated the studio staff, installing the pragmatic disciplines of animation, particularly that of producing quantity on time. As the Hanna Barbera studio wound down, the Disney Sydney studio opened in the 1980s to produce its animated, direct to video, feature films (Torre 2004b; Torre 2005a; Torre 2005b). A very prominent exception to the general trend at this time was Yoram Gross, who migrated from Poland and Israel in 1968, opened a studio in Sydney and, by 1977, had gathered a large staff of such competence and professionalism that he could embark upon a full-length animated feature. Dot and the Kangaroo is a quintessential Australian children’s story written by Ethel C. Pedley in 1906. Gross animated the characters of Dot and the bushland animals that she talks with, using for his backgrounds live action film shot in the forests and grasslands of the Australian bush (Torre 2004c). But it was the commencement of television in 1956 in Australia that spurred a tumult of activity and a vigorous competition for the consequent advertising contracts. Many small companies and independents found animation opportunities: two of such beneficiaries were Alex Stitt and John Scheffer. Serials, feature films and art animations followed. The Australian Government legislated a requirement that Australian commercial television broadcasters employ Australians; this was followed in 1960 with the requirement that all advertisements screened on Australian television originate in Australia; and this provision was strengthened in 1961 with the imposition of an overall Australian content requirement in the programs broadcast by the television stations. The concrete result of this legislation was to stimulate the commercial stations to create their own in-house studios in both Sydney and Melbourne. The Australian Government went further, creating the Australian Film Commission with funds to promote the production of feature films in Australia and further funds to encourage individuals wishing to make independent films. Currently a number of companies are producing both for entertainment and commercial use, and many animators have worked independently to produce films of interest and originality; Australian animated feature films have attracted international notice, and Australia recently received an Academy Award with Adam Elliot’s short animation ‘Harvie Krumpet’; also two nominations for Sejong Park’s Birthday Boy (2004) and Anthony Lucas’ The Mysterious Geographic Explorations of Jasper Morello (2005). 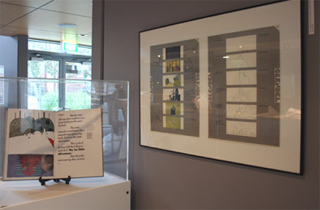 For the 2007 Animated Dialogues conference, we curated at the Victorian College of the Arts two exhibitions stemming from our research in recording Australia’s history in animation. 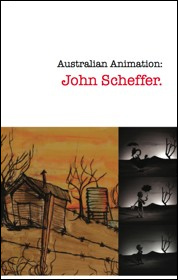 We simultaneously launched the first two volumes in a series of published monographs highlighting Australian animators. The exhibition and accompanying publications featured the work of two very disparate Melbourne animators. The immediate choice was the celebrated Alexander Stitt, who was the first Artistic Director of Fanfare Films, an animation studio created by Melbourne’s first commercial television station, Channel Nine, which commenced its operation with the introduction of television coinciding with the 1956 Melbourne Olympic Games. Stitt subsequently established his own studios, producing a ceaseless flow of work, both for commercial sponsors and for entertainment. 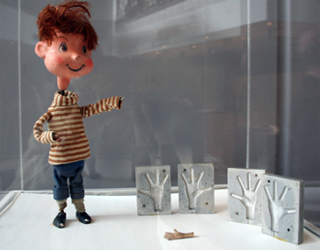 The second exhibition featured the work of John Scheffer, who explored the field of puppet animation in Australia. Scheffer, born in Holland, had migrated to Australia in 1955 and had died in 1984. His wife, Vivienne, living in Lorne, a popular seaside town west of Melbourne, was interviewed. She and their four children had retained much of Scheffer’s original work. The discussion bellow consists of paraphrased extracts from the illustrated catalogues of the two exhibitions. We derive the following text from an interview with Alex Stitt, 17 April 2005, and an interview with Frank Hellard, 3 September 2004. 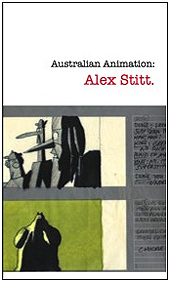 Stitt, one of the prominent figures in the history of Australian animation, undertook a design course at the Melbourne School, now the RMIT University. He recalls courses at that time offered in illustration, advertising design, and industrial design; but none related to filmmaking. Commencing with a homemade camera stand and a Bell and Howell camera which, ‘if you pressed the release button just enough, would take one frame of film; but which otherwise took continuous motion’, Stitt experimented with animation while still at RMIT. By 1957 he had completed the RMIT course and begun working professionally. Designer, Richard Beck, arranged that he occupy a freelance desk in Castle Jackson Advertising in the city, becoming a third member of the studio together with a layout artist and a finishing artist. Being the only one of the three with a design background, he was given design work for clients right from the start. He made it known that he could make animated commercials – ‘which I’d never actually done, but I had the feeling I would be able to!’ – and during the next two years produced some half-dozen which went to air. He and Bruce Weatherhead, who also worked on designs and stories, spent their days in the animation studio, but freelanced at night. According to Frank Hellard they worked, ‘endlessly, and they worked most of the night, coming to work late – although nobody would complain because they were obviously the key members of the team. Stitt wasn’t only a good designer; he had a gift for stories and design generally, and a fifth sense about what was possible in animation. He’d always think of a new problem which was soluble. He didn’t know how to solve it, but it was soluble! I think it’s an inventor’s pre-thinking of a solution to a job. He would write something into a story that you would really have to think about for a long time before you found a way of doing it.’ When Channel Nine halved the animation studio’s staff at the end of the first year, Weatherhead left. In 1963, Weatherhead opened a studio of his own and asked Stitt if he would like to form a partnership. Stitt resigned from Channel Nine, and spent the next ten years working with Weatherhead. Then in 1973 Stitt commenced the Al et Al studio. He has generated a vast amount of work including countless advertisements, title sequences and short films; and has produced two animated features. Fig. 5 – Cel set-up from Grendel, Grendel, Grendel. Photo by L. Torre; from the collection of David Atkinson. His work is striking for its careful attention to design, for its use of colour and form; yet, perhaps most intriguingly, in its use of line. Although the works themselves have been diverse, there is always an overall quality that labels each a design by Stitt. In the traditional animation process, colour, form and line are distinctive elements that come together in the assemblage of the completed work. Stitt makes use of these distinctions, whether it is the broken, staccato line of the characters in many of his screen advertisements (he jokes that he cannot draw a straight line), or his visually stunning animated features, Abra Cadabra, and then Grendel Grendel Grendel, that dispensed with the line altogether – a bold initiative, particularly at a time when the photocopied line universally predominated the cell animation production process. But even when he did utilise the black line to delineate his characters, it was always hand inked onto the cell, traced from the pencil drawing. Creative control was preserved – the mechanical photocopier was not allowed to mediate the line. Additionally, the absence of line on the characters influenced the manner by which they would need to be coloured, compelling modification to their design. It had a further subtle impact on their motion. Grendel Grendel Grendel, devoid of black outlines, achieved a certain status of dimensional believability. Rather than have the image flattened by the line, it seamlessly blended into the background, effectively using light, shadow and colour – the primary conventions of filmic representations to define space and form. But his designs are anything but photographic (although photographs and real objects were sometimes employed). His work has consistently been concerned with reducing imagery and motion to their essence, always acutely aware which facets were critical to maintain. Abra Cadabra took a further bold step with its innovative 3D process invented by Mike Browning for the production of this film, a process that involved complex multi-plane separations and projections. It created a convincing 3D effect, without actually requiring the two-camera system. The work utilises a moving text, often defined in a simple, hand-written style reflective of the approach towards much of the imagery. This use of typography effectively serves as a character design element, as well as communicator of information. Fig. 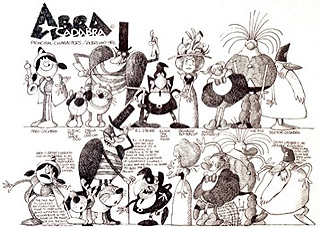 6 – Character design sheet (detail) for Abra Cadabra. Courtesy of Alex Stitt. Stitt retained his team of core animators. Often each would focus on a character and carry it through the entire production. For Abra Cadabra, rather than provide set character designs in the traditional sense, he produced a single design sheet containing no character turn-arounds or detailed measurements. This gave the animators a generous measure of creative freedom in developing the character according to their own perceptions, while keeping to the spirit of its distinctive design. It further allowed modifications to make the character more conducive to its motion requirements. Similarly, when the Victorian Government commissioned a series of television shorts aimed to persuade viewers to promote their health through exercise, Stitt created the character, Norm, for the ‘Life Be In It’ Campaign. Required to extend his movements, Norm’s design was modified and evolved, the animation thus influencing the design. John Scheffer (1915 – 1984). Fig. 7 – Cover of John Scheffer monograph. Although relatively unknown today, Dutch-born John (Jan) Scheffer was an Australian animator who produced stop-motion television advertisements from the late 1950s to the 1970s. He also produced a number of short films and experimental animated works. Scheffer’s tertiary education at the Amsterdam School of Art was interrupted by the outbreak of the Second World War. He became a fighter pilot with the Dutch air force, was imprisoned by the Nazis during the invasion of Holland, escaped the prison camp and reached London where he enlisted with the Royal Air Force as an instructor pilot. When the war finished, he developed his interests in drawing, painting and photography and, particularly, in stop motion animation. As an animator he was self-taught, working in the early nineteen-forties with an old cine camera. He never returned to art school. He met his Australian-born wife, Vivienne, in London, where they married and soon afterwards moved to Amsterdam. Here Vivienne attended the Amsterdam School of Art, completing a four-year diploma course specialising in design and fashion design. This enabled her to assist her husband in his later work, designing and colouring backgrounds for puppet films, setting up and assisting with the filming process. In Amsterdam, Scheffer was engaged by Joop Geesink Studios to work in the laboratory. The company, impressed with his tiny, three-fingered puppet hands fashioned uniquely from a plastic coating on a wire-frame armature, was keen to utilise his skill and newly developed techniques in making and operating the puppets. The company was the biggest producer in Europe at that time. Scheffer had begun experimenting with animation in London in the 1940s. Very little stop-motion puppetry was being produced in Australia at this time, and his studio operated in relative isolation. His studio was successful, contracting to make films for a number of manufacturing companies, advertising tap fittings, biscuits, socks, shoes and slippers. 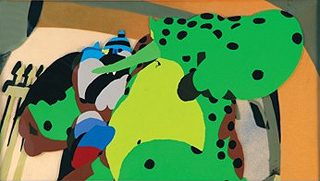 Not only did it lead – and in fact ‘corner’ – the market on stop-motion technique; it also capitalised on the newly introduced medium of television, which was providing a huge impetus to the growth of animation in Australia. Animation and motion were fundamental to the success of his work. But, in common with most stop-motion animators, the materials and materiality of the scenes were also of crucial importance. He was innovative with his production technique, willing to experiment with diverse materials. He created stop-motion water flowing from a hose using a series of cut-to-form sheets of plastic, changing them frame-by-frame. The cellophane-type plastic provided the reflective ‘water’ sheen. He then lightly sanded each of these sheets, achieving a scratchy, opaque animated texture that emulated the foamy quality of water spraying from a hose. His productions were often referred to as ‘puppet films’ rather than stop-motion, in effect, placing the emphasis on the object – the materiality – rather than the method of animation. Thus he felt free to imbue the objects with motion not only through stop-motion techniques, but occasionally using live-action puppetry. An example is a dragon hand puppet he created, through which he blew cigarette smoke to simulate the ‘fire breathing’ effect. The puppets were fabricated onto a wire armature. Starting with a suitable gauge of steel wire, several strands were bent to the shape and length of a limb, the ends held in a vice while the strands were twisted together, then soldered enough to hold the wire in place. This base was covered with a finer, copper wire the give the final shape, using a drill to spin the wire around. It was finally passed through the flame of the gas jet to be slightly tempered, which gave it suppleness and strength. Fig. 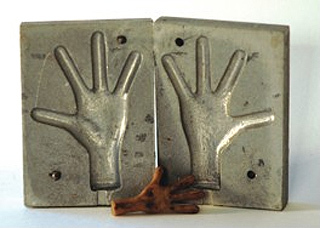 8 – Aluminum mould with foam-latex hand. The mould was made by Scheffer and cast in Melbourne. Photo by L. Torre. The hands were separate, made in moulds to different sizes according to the size of the puppet. The skeleton of the hand with the three fingers and one thumb would have the wire already centred. The moulds were made originally in plaster, later using aluminium; they would go to the foundry where a prepared mixture of PVC was poured into the each of the two halves. The two halves, placed together, were cooked in an oven. When cooled they were taken out, the edges sandpapered where the two moulds met to give a perfect set of hands. These were connected with long threads of wire into the existing frame of the puppet. The whole frame was covered with plastic foam, bound with linen, and finally clothed. It was significant that the puppet had only three fingers. This was to maintain the body proportions – a four-fingered hand would be too wide. Having their own armatures, the hands were fully functional. Extending this skill, he made artificial hands for several people who had lost a hand. He would copy the remaining hand, reverse it, then make a false hand out of plastic. He made his own hand as an example – an exact copy, even the veins and little marks! The puppet walked by balance, folding from one foot to the other. Scheffer would calculate the number of movements, allowing a twenty-fourth of a second per movement. The puppet heads were first made from balsa wood; but he developed fibreglass when this first became available. The mouth movements would be a built-in wire construction; or could be interchangeable, using very hard paper hand-painted around the outside of the lips to make the words. An alternative method to operate the lips was to cast them in zinc, interchangeable by means of a pin inserted in the mouth. Fig. 9 – Experimental acrylic and chalk drawings from, The Drought (1971). Photo by L. Torre. Courtesy of the Scheffer collection. In his later years Scheffer tended towards experimentation, often letting the materials dictate the direction of the work. He worked directly on to film, creating hand-made scratch-on-film; and he gained recognition and renown with his innovative film The Drought. Using rolls of paper, he painted a series of dramatic backdrops in acrylic and chalk featuring scenes of parched land, desperate farmers and stock These were pulled across rolls of a highly polished mirror foil in real-time and at a right angle to the warped reflective surface, producing reflected images that shimmered, blending and distorting, creating the strange, dreamlike, often surreal, images which he filmed. 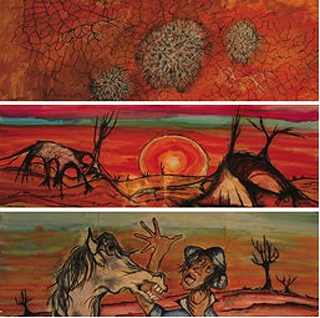 The Drought is a very Australian film, indicative of the cultural evolution in his work. John Scheffer Productions tapered off and slowly closed, ceasing business in the 1970s. Scheffer’s health was a contributory cause; but also changes were taking place in the industry, both factories and publicity moving overseas. ABC (2001) ‘Limelight’. [Online] Available from: <http://www.abc.net.au/limelight/docs/capture/4_1_2_1.htm>[January 12]. Bendazzi, G. (1994) Cartoons: One Hundred Years of Cinema Animation, Bloomington and Indianapolis, Indiana University Press. Bertrand, I. (Ed.) (1989) Cinema in Australia: A Documentary History, Sydney, NSW University Press. Bradbury, K. (2001) ‘Australian and New Zealand Animation’. IN LENT, J. A. (Ed.) Animation in Asia and the Pacific. Bloomington, Indiana University Press. Monahan, C. (1989) ‘Animated’. Canberra, Ronan Films. Quigley, M. (2005) Women Do Animate: Interviews with Ten Australian Animators, Melbourne, Insight Publications. Torre, D. & Torre, L. (2004a) ‘Joy Porter Interview’. Australian Animation Video-Interview Series. Melbourne, Australia. Torre, D. & Torre, L. (2004b) ‘Margaret Parkes Interview’. Australian Animation Video-Interview Series. Melbourne, Australia. Torre, D. & Torre, L. (2004c) ‘Yoram Gross Interview’. Australian Animation Video-Interview Series. Melbourne, Australia. Torre, D. & Torre, L. (2004d) ‘Frank Hellard Interview’. Australian Animation Video-Interview Series. Melbourne, Australia. Torre, D. & Torre, L. (2005a) ‘Robbert Smit Interview’. Australian Animation Video-Interview Series. Melbourne, Australia. Torre, D. & Torre, L. (2005b) ‘Gairden Cooke Interview’. Australian Animation Video-Interview Series. Melbourne, Australia. Torre, D. & Torre, L. (2005c) ‘Alex Stitt Interview’. Australian Animation Video-Interview Series. Melbourne, Australia. Torre, D. & Torre, L. (2007a) ‘David Field Interview’. Australian Animation Video-Interview Series. Melbourne, Australia. Torre, D. & Torre, L. (2007b) ‘Rod Lee Interview’. Australian Animation Video-Interview Series. Melbourne, Australia. Torre, D. & Torre, L. (2007c) ‘Neil Balnaves Interview’. Australian Animation Video-Interview Series. Melbourne, Australia. Torre, D. & Torre, L. (2007d) ‘Vivienne Scheffer Interview’. Australian Animation Video-Interview Series. Melbourne, Australia. This entry was posted in Dan & Lienors Torre - Recording Australian Animatio and tagged Australia, history, narrative. Bookmark the permalink. well done! it is such an informative for peoples. keep it up, the animation is the future, we are well aware of the increasing demand and competition in this field. We have a team of highly skilled and creative team working endlessly with an aspiration to change the face of global entertainment and marketing with the use of cartoon 2D/ 3D animation and other media features.